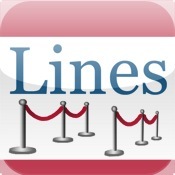 Today in Travel Tech, the Lines app from Touringplans.com is on the block. This app started as a basic wait time app, and has added a multitude of features that are simple, effective, and available across almost any device you have including iOS, Android, Blackberry, and any phone with a mobile browser. It's not free (app is free to download, $11.95 per year for access), but the small charge is well worth the functionality it provides. Click on for the complete story! If you aren't familiar with the TouringPlans site and their work, I highly encourage you to check them out. They are associated with the Unofficial Guide to Wald Disney World series of books, available from pretty much anywhere across a multitude of e-devices if you have them. If you don't know the Guide, I also find it a fantastic resource, but that's entirely another blog post. The lines app uses a colorful but text-based interface. The upside is that the app screens load quickly and accurately every time. It isn't flashy, colorful, or overly cool other than the info it can give you so you don't get sunstroke waiting in lines. Lines can also give crown info, park and extra magic hours, as well as recommend parks to visit and avoid every day. Simply click on a park for detailed ride and show information and to input real-time wait numbers if you are in the parks. Each attraction may have a picture, but you can shut them off if you are over 3G for quicker loading. The bar on the bottom provides some more basic navigation for selecting your park, touring plan, or seeing some predictions for the best and worst parks for the next 10 days. Efficient is the best word that comes to mind when seeing the design, but this simplicity gives the app flexibility to be run on almost any phone with a mobile browsing capability, smartphone or not. TouringPlans uses a ton of historical statistical analysis to accurately predict crowd levels and attraction wait times across the parks. The predictions are combined with researchers on-the-ground in WDW and user data to give what may be the most accurate times of any app I have used in the parks. If you are in the parks and posting wait times, there is a cool chat feature and a badge system for posting wait times in different locations and frequencies. The user with the most posted times is given a shout at the bottom of each attraction page. It isn't the most robust social networking setup, with no Facebook or Twitter integration, but you may not be tweeting or updating your status much while following one of the touring plans. Not familiar with a touring plan? They are special algorithmically-derived plans to get your around the parks most efficiently. The statistician estimate the proper use of a plan can save you up to FOUR hours on lines during a single day. The people at touringplans.com have a ton of plans for each park, meant to fit your specific needs. They can be accessed from within the app and you can click 'done' to move to the next step on the plan. They won't cut down on walking (as they frequently make you cross the park completely), but they will help you stay ahead of the people standing on Main Street staring at the park maps as if they have the answer to life, the universe, and everything. Touching an attraction brings up any info like height restrictions, showtimes/operating hours, current FastPass information, and their predictions for later in the day based on the current data. This has been extremely accurate in practice, more so than any other waiting times app I have come across after testing quite a few in the parks. You can easily add your own time using the button in the upper right (photo below). Lines does not sport the mapping or social networking functionality of some other apps, but the accuracy and math behind the plans provide an experience that a conglomeration of user data simply can't equal. The $11.95 can also be discounted if you buy a copy of The Unofficial Guide or have a discount code from one of their partner websites. The yearly fee also gives access to the main touringplans.com site for some great planning information and customizable touring plans. For the price, it is easily your most expensive app option for a WDW vacation. It may be the best investment for your own sanity, especially traveling with children during busy times of the year. I would recommend Lines to any Wald Disney World visitor. If the cost is getting to you, think about it this way. A family of four might spend $3,000 over a week in Disney. $11.95 is less than half a percent of the total cost of the trip, and can save you up to 28 hours in line for the week. For you value-savvy travelers out there, that adds up to a whopping $0.43 for each hour saved.